Sockerkaka is a delicious sponge cake from Sweden, which is very easy to make. In Swedish, the two words Socker kaka, separated, mean sponge cake but both of them together literally translates as “sugar cake”. In Sweden they bake the cake in these special moulds, called “sockerkaksform” but if you have a bundt cake or other fluted baking tin, you can still make this cake. You can buy a “sockerkaksform” in good kitchen stores or online. Search for baking tins (pans) called”Bundt”, “Kugelhopf”, “Gugelhupf” or simply”fluted cake ring”. They are all very similar, so choose a non-stick tin with an attractive pattern. When I decided to make this cake, it was for my husband’s name day on the 26th October, which in Greece is celebrated even more than birthdays. I decided to make it in a spring-form pan in order to make a birthday cake for him. For this reason, I doubled the original recipe. However, the amount of sugar seemed too much for my taste. As I wanted to add a frosting on the top, I used half the amount of sugar. It came out perfect. Line a 23 cm spring form pan with parchment paper and grease and flour the sides. Melt the butter and add the liquid so that the temperature of the butter drops. I added water to the butter but you can substitute it with fresh fruit juice or milk. Prepare all the dry ingredients. Put the flour, baking powder, salt and vanilla sugar in a bowl and mix to combine. You can sieve them if you like, but I did not. Note: If you want to make a chocolate cake “Chokladsockerkaka” remove 4 tbsp flour and replace with 4 tbsp cocoa powder. After beating the sugar with the eggs until white and fluffy, gradually add the wet ingredients (butter + water) and then all the dry ingredients. Bake the cake and remove to wire rack to cool. As pomegranates are in season, I made some pomegranate syrup, which I used to wet the sponge but also to flavour and sweeten the filling. The pomegranate syrup was enough for both cakes. I made the same cake twice, so below you will find instructions for two different options for decoration and you can choose whichever you prefer. The first time, I made the filling of the cake with a light and fluffy mousse, with melted couverture chocolate, whipped cream and pomegranate syrup. Attach the whisk attachment to a standing mixer or use a hand mixer. Whisk the heavy cream on medium-low speed until foamy, about 1 minute. Add the pomegranate syrup and vanilla, increase the speed to high and whip until soft peaks form, for 1-2 minutes. Refrigerate. Melt the chocolate over a double boiler. Remove it from the water bath and mix with a spoon until it chills but still be runny. Whisk the cream again on low speed, adding the melted chocolate spoon by spoon, until you add it all and it is incorporated. Keep the cream refrigerated until ready to use. To decorate the cake, I made a glaze with white chocolate, cream cheese and double cream. Melt the white chocolate over a double bath. Whisk the heavy cream with the cream cheese and vanillin. When the white chocolate cools, add it to the cream cheese. The second filling was made with cream cheese, double cream and Greek yoghurt. When these three ingredients were combined and whipped, I removed 1/2 cup which I used in the glaze. I added some icing sugar and pomegranate syrup to the remaining cream. To give it a pink colour, I added 2 drops of red food colour. I made the glaze with white chocolate, pomegranate syrup, vanilla and reserved cream from filling. After adding the filling in the middle, there was some leftover cream, which I mixed in the glaze. Cut the sponge in layers. For the first cake I cut it in four slices and wet each slice with pomegranate syrup. The second time, I cut it in two slices. Put the first slice in a platter and fit the ring around it. Add one third ( 1/3) of the chocolate cream. Repeat with the other slices and cream, until you add them all. Refrigerate for an hour and remove the ring. 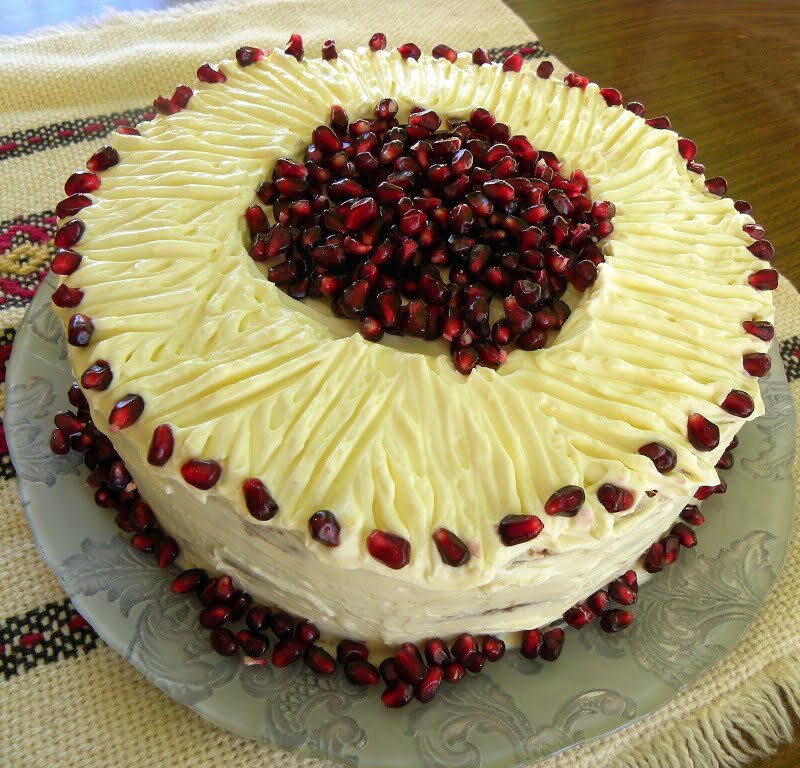 Put the glaze on top and decorate with the pomegranate seeds. Sockerkaka, is an easy and delicious sponge cake that comes from Sweden. It can be eaten as it is or made into a birthday cake. Preheat the oven to 180o C and place the rack in the middle of the oven. Melt the butter, remove from the heat and add the water. Beat the eggs with sugar on high, for about 5 minutes, until light and fluffy. In the meantime, combine all the dry ingredients. Add the butter and water gradually. Lower mixer speed to low and add the dry ingredients. Bake for 50 - 55 minutes or until a knife inserted in the middle comes out dry. Remove to a rack to cool. Pass a knife around the sides and remove the cake from the pan. Serve as it is or decorate as you like.